We’ve been dealing with some nasty heat here in central Va. It’s been so hot that even the pool is not a good idea during the day. The water in it is up to almost 100 degrees. That’s the one downside to a smaller pool – the water heats up fairly quickly in this brutal weather. It’s been real work making sure the chickens have plenty of water and keeping the garden from frying up to nothing. As for us, the lighter the food, the better. I brought home some local peaches last weekend with the intent to make a cobbler but never got around to it. Then the kids snacked on a few, and before I knew it I had too few overripe peaches to do much of anything with. But what I DID have was a new popsicle mold sent to us by our lovely friend Jen. I also had a big tub of Greek yogurt that was nearing its expiration date. Et voila! Just like that an idea was born. I threw the peeled and chopped peaches into the blender along with the yogurt and a splash of vanilla extract and whipped them up. 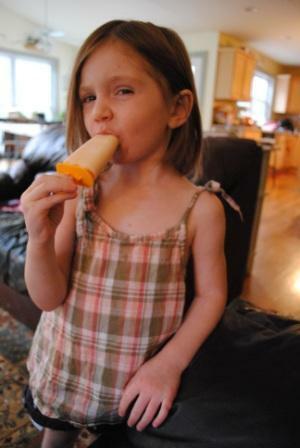 Then we poured it into the popsicle mold and stuck it in the freezer. No recipe required, and Oona approves! Awesome. Cool, light & enough protein for diabetics like me! I’ve been doing exactly the same thing but with all the leftover fruits mixed together…those last few strawberries, and the grapes that have only one more day, one almost mushy banana, and any other fruit that happens to be around…pineapple is the favorite add in around here. Into the food processor with a bit of yogurt and into some little dixie cups with sticks and into the freezer they go!